Food Traceability Software - Carlisle Technology, we wrote the book! Food traceability is achieved through a combination of best practices, defined processes, standardized data collection, and reporting. It’s best automated with technology to make the whole process more efficient, to reduce the inherent costs, and to provide supply-chain partners, regulators, and consumers with timely information specific to the production of their food items. Increasing regulation in the food industry requires food traceability to a certain degree, but good business practice demands that food producers, food processors, distributors, and even retail chains go beyond simply providing the minimum accountability. Choosing the right traceability solution is a personal journey. If it’s done right and implemented properly by the right solution partner utilizing the appropriate, proven technologies and best practices, it’s fair to say traceability should not be considered an added cost but an enabler to your company’s long-term success. With over to 30 years’ experience implementing innovative productivity solutions on to the plant floor, Carlisle Technology has the tools and the know-how to accurately automate the critical data collection within your production processes and quickly reproduce that data into meaningful recall reports to satisfy even the most demanding traceability requirements. Want to know more? Get the Food Traceability for Dummies book! Experience rapid ROI – Reduce costs, improve profits, solidify your brand! 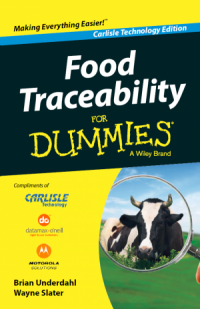 We would love to send you a FREE Traceability for Dummies Book! Just let us know where to send it. Tell us about why you are interested in Traceability!